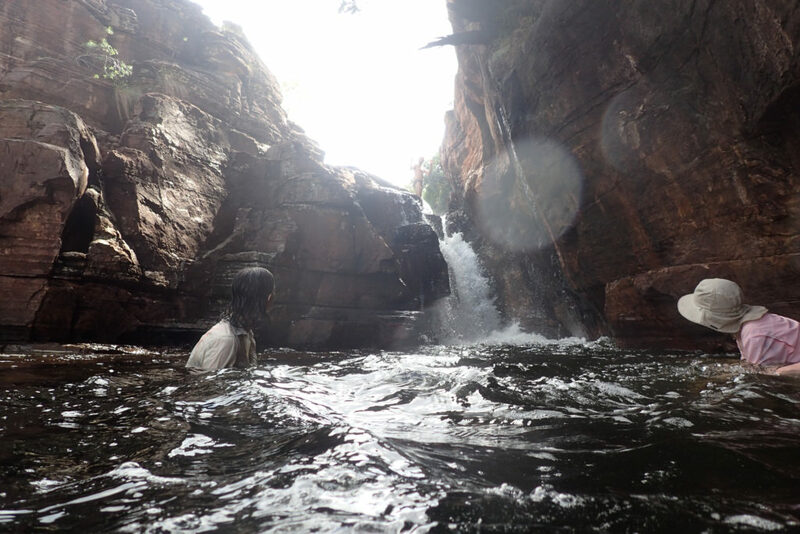 From the dry, cool confines of Canberra in spring, the idea of spending two weeks hiking in tropical Kakadu National Park seemed like the adventure of a lifetime and I signed myself up excitedly. As the hike drew nearer, however, I started to get nervous about hiking in the tropics. 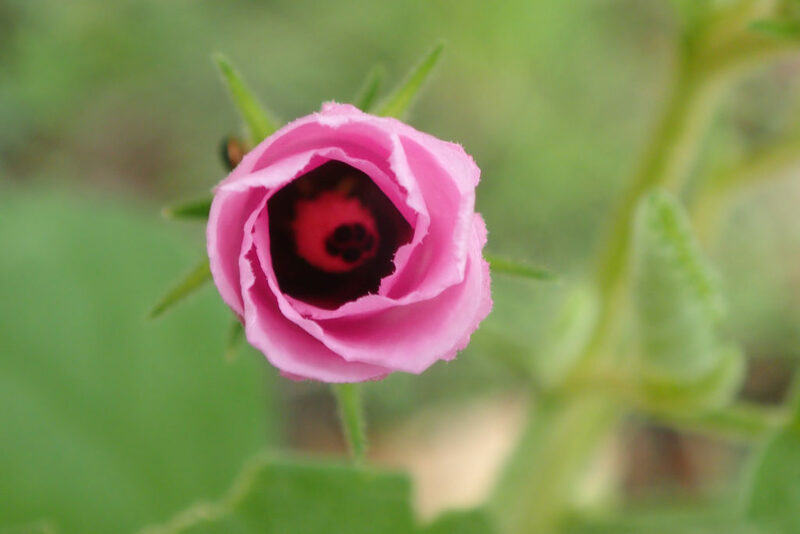 Now that I thought about it, I wilted like a dying flower in hot conditions. But it would be the wet season, and this would bring cooling rain and cloud shade… hopefully? I now know I was right to be excited and right to be nervous. The hike was one of the hardest and best things I’ve done. We were a group of seven including our guide, Don, and there didn’t seem to be any egomaniacs, narcissists or psychopaths among us, which was a relief. Don briefed us the night before we started – it had been the hottest February on record, with very low rainfall, creating particularly challenging conditions for hiking. Thank you climate change. 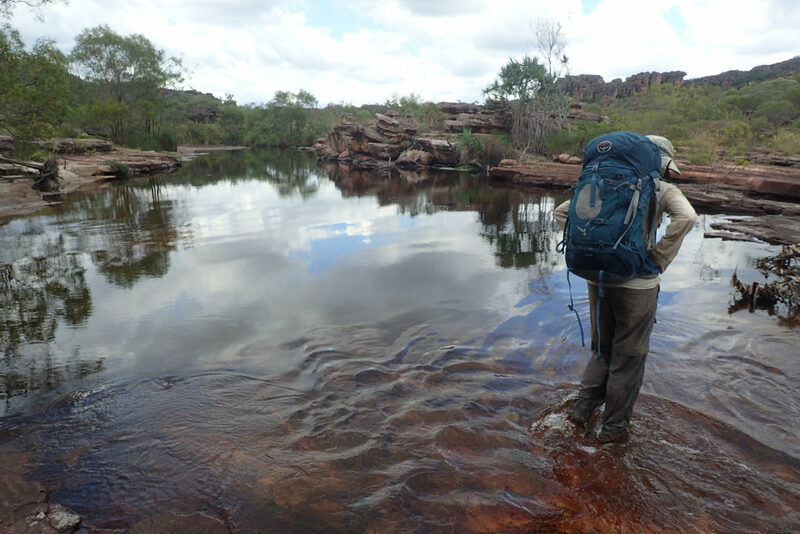 In general, all the locals we spoke to in the NT thought we were completely crazy to be hiking in the wet season and expressed genuine concern about our welfare. But we were doing this for a reason. Wet season meant there would be water flowing in the Baroalba plateau we were headed to, meaning, quite crucially, there would be drinking water. Plus places to swim and a lush and green landscape. 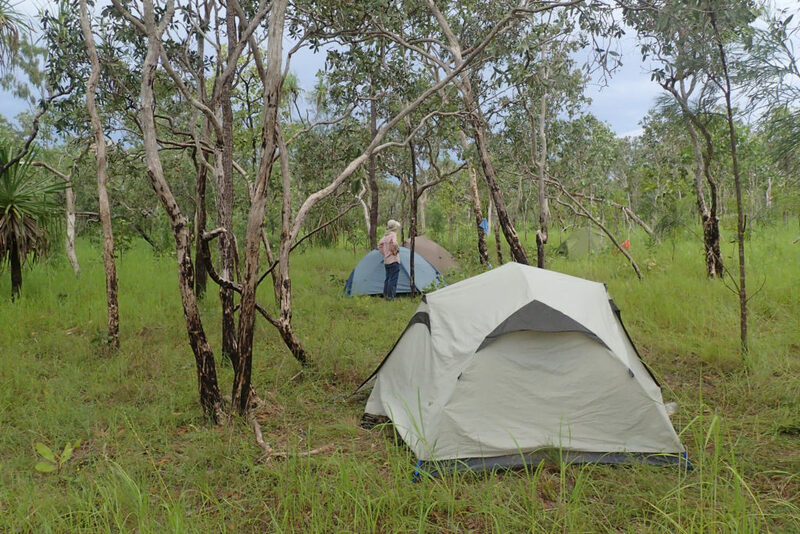 We headed to Kakadu in an old Landcruiser without air-conditioning, and it was so hot that I had mild heat stress by the time we got to our campsite. Concerning given this was well before even attempting to hike in 36 degree, 70% humidity with a pack on. Our campsite that night was an abandoned air-strip at the bottom of the plateau, which radiated heat from the day back at us and harboured a plague of bloody-snouted mosquitoes. We ate dinner around the campfire under a violet-lit electrical sky, hairs standing up vertically above our heads. I subtly crouched down lower to the ground hoping not to be the one to get struck. Later that night, dripping with sweat in our strobe-lit tent I considered that I would most likely be killed by heat stroke or lightening before the two weeks were out, and seriously considered abandoning the hike before it would involve an expensive helicopter evacuation. But the morning arrived and I took a deep breath and put on my pack as we left the safety of our vehicles for the next 12 days. We passed through a few kilometres of flat grassy land, then into a lush rainforest pocket, where fig trees and vines stood cooling their feet in crystal clear creeks, then up through a furnace-like pass of hot, exposed rock. By the top we were all dripping with sweat, but one of our group members was feeling dizzy and thought he would throw up so we found a shady crevice between some rocks and gave him a few hours to recover and drink lots of water and electrolytes. When we eventually arrived at our campsite, a grassy clearing on a cascading river, a storm burst out of the towering cumulous clouds to drench the earth with rain. The next morning we came across a beautiful deep and crocodile-free water hole, where we swam whilst electric-blue butterflies feasting on the salt in our sweaty clothes. But one of our number didn’t join in, sitting in the shade too exhausted to move. Something wasn’t right, and perhaps it was more than just heat stress. The difficult decision was made, and Don used the satellite phone to call a helicopter. 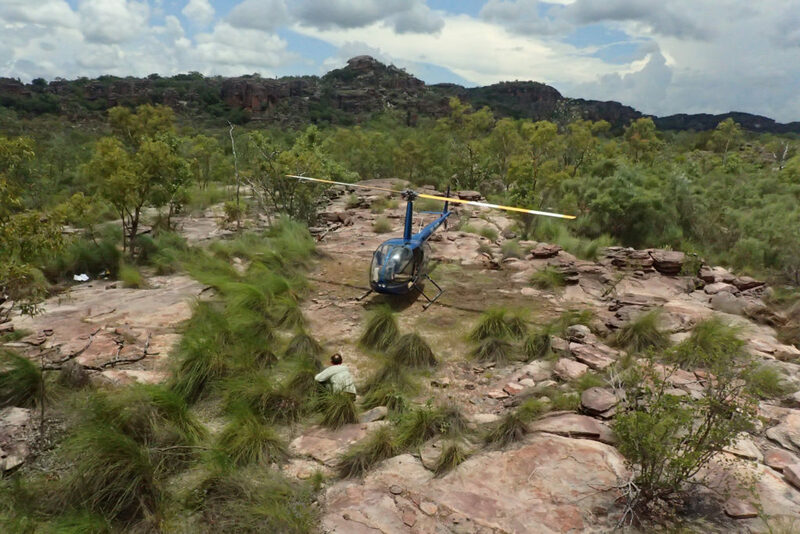 We all prepared a clearing for the helicopter to land in, which involved kicking spinifex grass tufts and dragging them away in the very hottest part of the day. All of us dispersed to hide in rock crevices like lizards till the chopper came. The evacuation was successful, and the pilot joked ‘I’ll see you in another couple of days, then”, much to Don’s chagrin. It looked like I might prove the helicopter pilot right, as I was stumbling through the afternoon feeling very, very overheated. I succumbed to heat stress only a short way from camp, lying dizzy and weak under a big shady rock and attempting to rehydrate whilst my pack was ferried to camp for me. I wondered how I would endure nine more days of this. After an hour I was feeling strong enough to walk to our camp where I cooled down in a shallow river with a livid grey storm bearing down on us. As it hit we all scurried into our tents to endure the furious wind and rain. The rain eased as night bloomed, but didn’t stop. We stood around in the drizzle, holding an umbrella over the campfire to cook our dinner! That night I discovered that during the chopper removal spinifex grass had pierced my bright yellow inflatable sleeping mat, which we used to attract the attention of the chopper, in multiple places. By the next morning, I was feeling lacklustre but able to carry my pack again. As we hiked further up the valley, it suddenly opened out into a vast rocky scene so majestic that my exhaustion was eclipsed entirely. A few hundred metres away in every direction, sandstone walls rose up sharply, surrounded by a jumble of massive stone blocks, as if tossed by a giant baby. We made camp on a sandy bank, above which a little waterfall cascaded down providing pure drinking water and a cool swimming hole. As I filled up our bottles at camp that afternoon, I noticed rock art handprints on the little overhang next to me. That night Don read us poetry by George Chaloupka as we sat in the flickering firelight. Over the next few days we explored amazing rock shelters, many perched up high with panoramic views over the valley. We saw a huge mural of an emu being speared by a hunter who hid himself behind a handful of branches – the spitting emu, so called because blood or maybe life-force is shown escaping from the emu’s mouth. We saw a haunting painting of a thylacine, or Tasmanian Tiger, extinct on the mainland for around 5,000 years, and now gone forever, nuzzling it’s young. We saw a huge crocodile that stared out of the wall with oversized white eyes. We also saw paintings of spirits, stencils and prints of hands of all sizes, including little children. We saw paintings of snakes, geckoes, fish, people playing didgeridoos, fish traps, wallabies, bats, turtles…. We spent a lot of time in shady shelters, quietly contemplating the meaning of the art we saw, and imagining life as it might have been throughout this ‘deep time’. I tried to come to grips with the meaning of 50,000 years of Aboriginal history – which is at least 1,600 generations. I started to think about how rich and abundant life was here, with people wearing elaborate headdresses and body ornamentations, like neck and arm-bands woven out of colourful rainbow lorikeet feathers, sharing epic dreamtime stories shared around the campfire under stars and coming together in times of music and dancing. I imagined what it might have been like to feel a bone-deep sense of belonging to the land and to one-another – being enveloped in the fabric of family and community and really knowing who you were. I started to feel a sort of grief for this lost sense of belonging, which can seem so absent from modern life. Knowing who you are, what your purpose is and where you’re from is so far out of reach for most of us today. We are often so far from the people we love, who make us feel that we belong. One night I woke up suddenly in the early hours of the morning, feeling completely alert and awake, struck by a deep feeling of appreciation and love for my own family, and my own tribe of friends. A recognition crept over me that we weave a fabric of belonging for one another too – it might not be quite the same thing in form, but maybe it was exactly the same thing in essence and I was suddenly terrified that I’d taken these precious connections for granted in the past. After a few days in this magical valley, it was time to keep moving. We travelled down from the plateau through a little rainforest pass between the cliffs, and traversed the woodland savannah below. By the time we got to our next camp, nestled in the actual Arnhem Sandstone plateau, we had been walking for around ten hours with very little shade, under a blazing sun. We constantly drenched our hats and clothes in water and I drank over 8 litres of water. 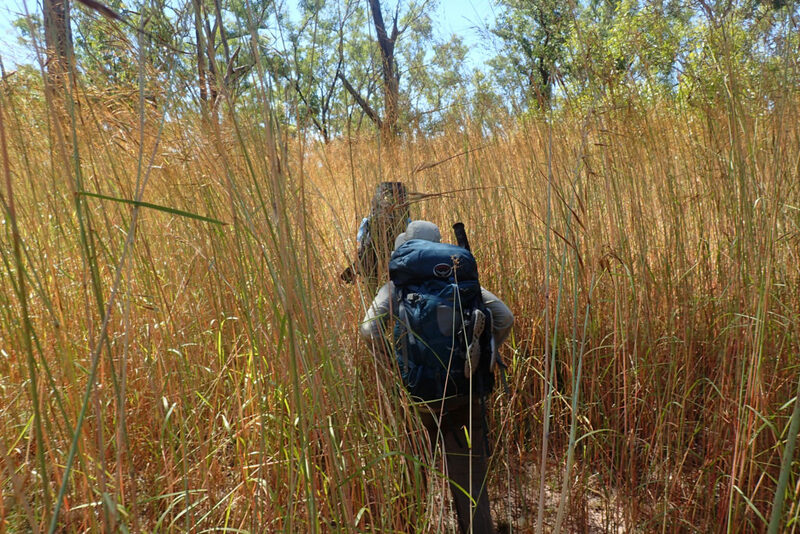 I also had a ‘trekking umbrella’ which Don, our guide had lent me, and which had the dual function of protecting me from the sun as well as the two metre high spear-grass we had to push through. I surprised myself by not only staying alive, but feeling animated and energetic. Was I finally adapting to the conditions? Or perhaps just learning to lift my gaze away from my physical discomfort, and focus on the beauty of the journey instead? Now the next big adventure of the trip was about to begin – getting to the top of Hill 420 – which sits 420 metres above sea level, and about 400 metres above the savannah below. It might not sound like a long way up, but it is stone country, and has a reputation as a challenging hike, especially in very hot conditions. It is very exposed to the sun at times, and involves a lot of clambering and climbing up rocks rather than just walking. On top of this, it’s very easy to get lost, as you have to make your way through a labyrinth of rock chasms and slots. Even using GPS waypoints isn’t that helpful as you may be only 20 metres from a waypoint but could have to walk kilometres around sheer drops to get there safely. We were using a series of hand-drawn maps provided by a hiker from Darwin Bushwalking Club to find our way, with clues such as ‘look for a palm tree in a slot between two rocks’ and ‘turn right through a patch of sticky grass’ to guide us through the stone walls. A previous group made it up Hill 420, but hadn’t been able to find the same way back that evening, being forced to camp on the way down without tents or dinner! Don didn’t think I had a high chance of success in making it up 420, being so susceptible to heat stress. On top of this, one of our group had an infected leg from a cut where he fell over, so Don thought the two of us should sit it out. But after a discussion, the group decided no-one was was a ‘peak bagger’ (a term I had never heard before) and everyone was happy to go as far as the weakest link could make it, and then turn around and come back. So we were all in! We started out just before sunrise, trying to get a few hours behind us before it got too hot. We clambered over boulders and through shady chasms . We had been cautioned not to attempt Hill 420 if we had an ‘extreme’ fear of heights. I reasoned that my fear was more ‘severe’ than ‘extreme’ and mostly based on rational self-preservation instincts. At one point, however, the only way forward was to make a ‘leap’ across a 15 or 20 metre drop from one wall to another. If it was only a metre or two down you probably wouldn’t think twice about it, but with the drop, it felt very different. This made me pretty nervous and I sat trembling as the others all went across until finally it was my turn. Then I stood right at the ledge, looking across trying to pretend it really was only a metre drop. Without actually deciding in my rationale mind, suddenly my body simply took motion and I found myself leaping across in the manner of an ibex. 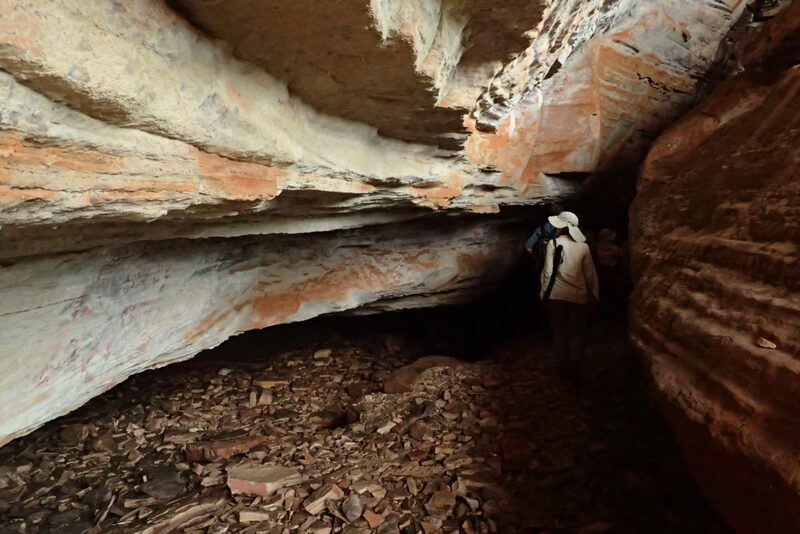 We continued up, making a lunch stop in the shade by crawling into a hole in a cliff-face, looking out over Kakadu like white-bellied sea eagles. We ate Laughing Cow cheese and vegemite on mountain bread whilst looking over a vertigo-inducing view. 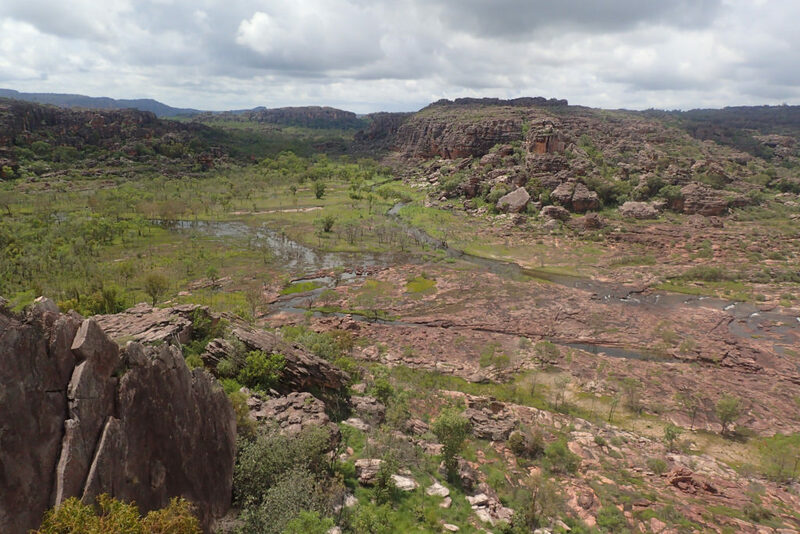 Then up onto the top we went, a large, round, rocky clearing with 360-degree views over the varying weather systems currently at play across Kakadu. On one side a lightening storm was rolling towards us over Arnhem Land, whilst the sun shone brightly over the yellow-green savannah on another side and elsewhere, fat, grey monsoonal rain clouds trucked in from the north. We made it back down before nightfall and lay sprawled over our rock platform like shipwreck survivors, watching on helplessly and gratefully as Don cooked our dinner over the fire. The day after our huge effort to get up Hill 420, we only made it about three kilometres before my body went into some kind of zombie exhaustion mode – just as Don had feared, I had over-exerted myself. I sat down in the shallow creek to cool down and there I stayed without speaking or moving for the next hour. I was undeniably the weakest link. But for the first time on our hike, the rain started to come down hard, and everyone kindly agreed to set up the tarp and stay put, and walk a bit further over the next two days to get out on time. The next day, having rested so well, we made it across the unforgiving savannah country in record time, and our last night was spent watching the stars through our tent’s mosquito screen, hiding from mosquitoes that were not even slightly deterred by clothing or tropical-strength repellant, and compulsively scratching bites. As our last day arrived, I couldn’t deny that I was looking forward to a real mattress and even air conditioning. 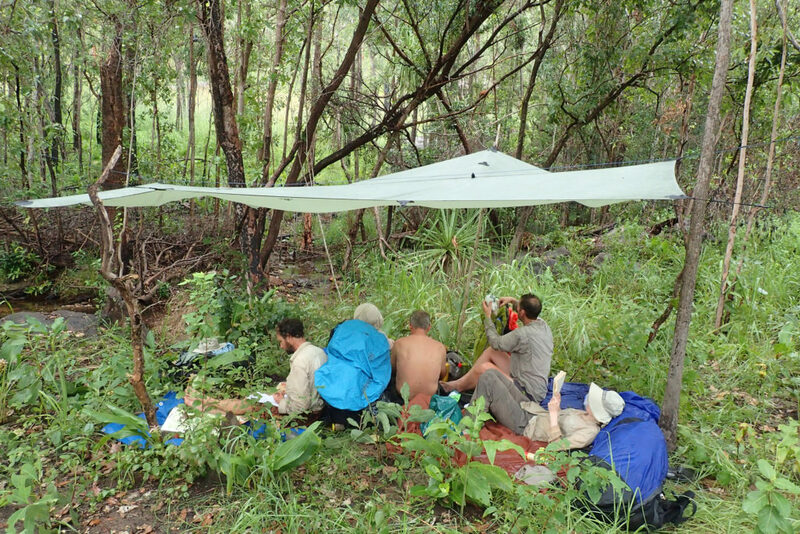 As much as I loved being in Kakadu, I wouldn’t have volunteered to spend another night camping there at that point. But there was still one final lesson in humility and respect for us. On our way out we passed through an area that is protected because Jeffrey Lee, the last member of the Djok clan who own the land here, recently cancelled the Koongarra mining lease. In doing so, he turned down what would probably have been millions of dollars in royalties, in order to keep the land intact and prevent another large uranium mine being built in Kakadu. Jeffrey Lee now wants to build an outstation here to live on his land and maybe get involved in tourism, but he can’t afford it. The irony is devastating, but hopefully Jeffrey will find a way to make this project a reality, with the support of the broader community. We trampled through this land, trying to understand something of it, not really much less clumsily than the feral buffalos, but luckily small in number and carefully restricted by Parks Australia to limit our damage. But as we walked, we were privileged to glean a tiny insight into this place and the incredible skill, grace and knowledge of those generations who walked this land for tens of thousands of years, and continue to do so today. As each step took us closer to leaving this place behind, I felt like the physical suffering of the hike was simply the necessary toll required to experience this place. To experience it not from a plane, like a spirit or a bird, but by foot, one step at a time, where you could see every detail. We climbed through a rainforest pass filled with hundreds of different-coloured butterflies, and I took the time to notice, to remember, everything – the orchids in the trees, the bright-pink wild hibiscuses and blushing ginger flowers. The little fields of yellow wildflowers, glowing in the bright sunlight. The every-coloured grasshoppers that sometimes popped out of the grass and other times sat silently, watching our passage. I did this trip with Willis’s Walkabouts. 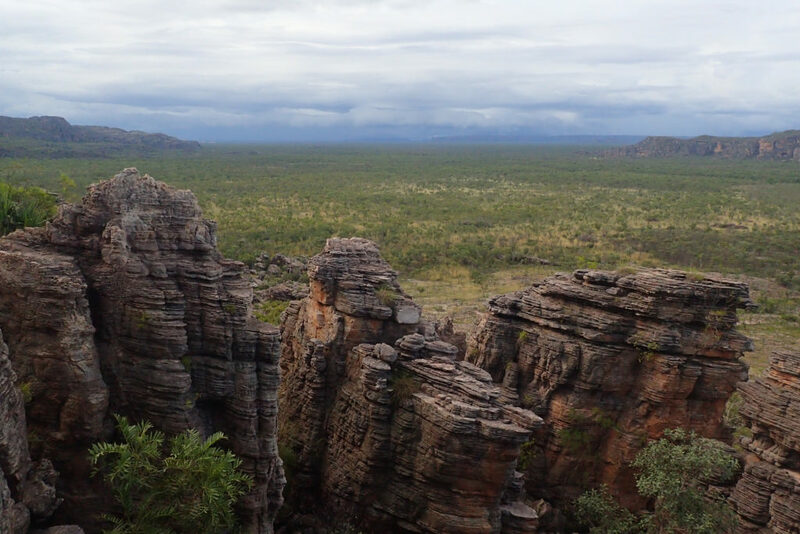 Kakadu is a national park owned by the Bininj/Mungguy people. A permit is required to hike in the Baroalba area. I am very grateful to have been granted permission from the Traditional Owners to spend time in this incredible place. 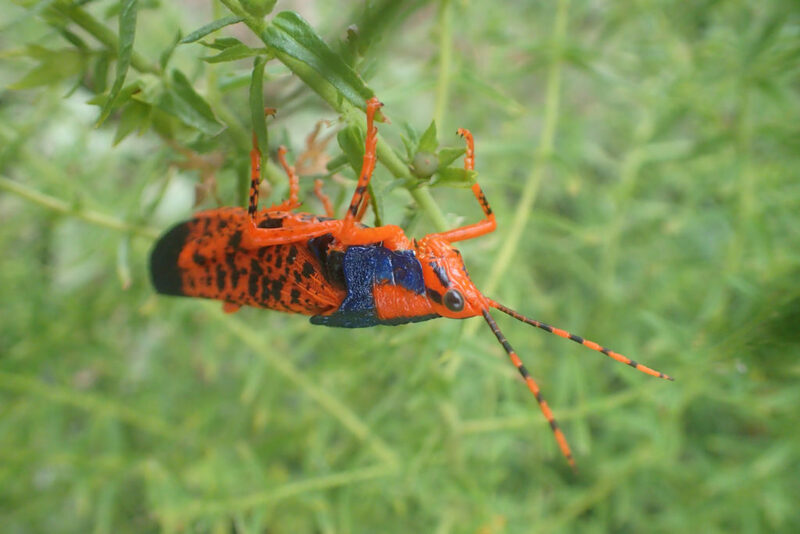 ALYURR (CHILDREN OF THE LIGHTNING MAN) OR LEICHHARDT’S GRASSHOPPER.